Seabrook at War: A Radio Documentary. 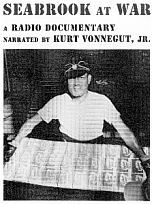 Narrated by Kurt Vonnegut, Jr. Written and Produced by Marty Goldensohn and David Steven Cohen. A co-production of WWFM/WWNJ, Trenton and the New Jersey Historical Commission, Department of State, 1995. Seabrook workers at the unloading dock. 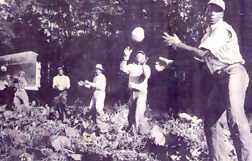 From a Life magazine photo, Jan. 3, 1955.
this agricultural communitys wartime image. Seabrook At War captures these experiences in an hour-long oral history of what narrator Kurt Vonnegut Jr. calls a story of "labor, loyalty and loss." The oral history begins by explaining the history of this southern New Jersey farming community. Charles F. Seabrook, known to his family as "C.F." 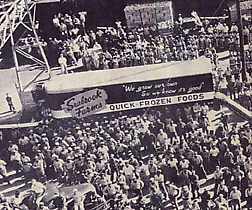 and to the rest of the business world as "the Henry Ford of agriculture," first established Seabrook Farms as a model of mechanized farming in 1911. Jack Seabrook seeks Japanese-American labor. to the War Relocation Authority to request the release of interned Japanese Americans to come to work on the company farm. workers. From Seabrook at War. transplanted families in fact remained at Seabrook after the war where the company continued to grow and prosper. 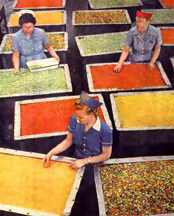 By 1955, Life magazine heralded Seabrook as the largest vegetable factory in the world. From Peru, to Texas, to Seabrook. On the whole though, the agricultural workers tell a different story. They recount a work routine of long hours, poor pay, and pitiful living conditions. And above all, they describe the complete disruption of their lives. Ginzo Murona, for example, was living in Peru when he was removed from his family without notification and placed in a Texas internment camp. In the many interviews, the parents who moved to Seabrook and did most of the labor convey their stories without bitterness; in contrast, their children express strong feelings of resentment. It is they who most sharply tell a tale of injustice and the denial of civil liberties. The story of this one wartime community sheds light on several overlapping narratives. The oral testimony of the Seabrooks and their workers effectively conveys the complicated nature of the American home front. The relocation experiences of Japanese Americans reflect only partially the tremendous growth of governmental authority during World War II. In addition, the internment and treatment of Issei and Nisei citizens also raise complex questions about race and racialized stereotyping. Finally, the experience at Seabrook provides a window into the history of agricultural labor relations and commercial, scientific farming. The history of Seabrook captures each of these themes nicely. Overall, this one-hour oral history would work well as an effective teaching tool. Students can easily grasp all the major themes, and the various voices evoke vivid images. A Seabrook Worker. Cover from Seabrook at War. Though some of the workers themselves depict the harsh conditions they faced, the interviewers might have included more voices of discontent, including perhaps some contemporary anti-Japanese radio clips. But in this way, the story of Seabrook Farms presented here serves as a useful starting point for an undergraduate research project on the home front during World War II. Because Seabrook ultimately employed 2,500 of the 120,000 interned Japanese-Americans, it received wide coverage in local and national newspapers and magazines. The internment itself has of course gained much scholarly attention by legal, political, and social historians, and Seabrook is the subject of at least one article. Thus, Seabrook at War would enhance many 20th-century American history courses. With the permission of David Steven Cohen and the New Jersey Historical Commission, The Journal for MultiMedia History presents Seabrook At War: A Radio Documentary in its entirety. To facilitate listening, we have divided the original one-hour program into two parts. Seabrook At War: A Radio Documentary. Part I.
Seabrook At War: A Radio Documentary. Part II.